Ladies and Gentlemen . . . now for a guest post from my Hot-Pocket-lovin' sister, that shocked me by making Hot Spiced Wine tonight: This past weekend I traveled to Chicago to enjoy 11 degree weather. I had the pleasure of taking a stroll through the "Christkindlmarket", a German festival held in the Daley Plaza. There was a wide variety of traditional German 'treasures': wooden carvings, cuckoo clocks and gingerbread-hangy-things (that were surely inedible). But the best part of the Christmas market was the hot spiced wine, or Gluehwein, served in tiny decorated commemorative mugs. Upon my return to 60 degree weather in Dallas, I thought it was imperitive to try the traditional recipe for myself. It turned out gooood... 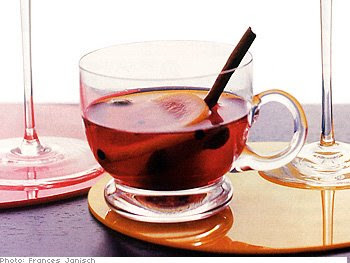 Hot Spiced Wine 3/4 cup water 3/4 cup white sugar 1 cinnamon stick 1 orange 10 whole cloves 1 bottle red wine 1. In a saucepan, combine the water, sugar, and cinnamon stick. Bring to a boil, reduce heat, and simmer. 2. Cut the orange in half, and squeeze the juice into the simmering water. Push the cloves into the outside of the orange peel (like you did in third grade), and place peel in the simmering water. Continue simmering for 30 minutes, until thick and syrupy. 3. Pour in the wine, and heat until steaming but not simmering. Remove the clove-studded orange halves. Serve hot in mugs.